Female Transformation Of The Week - Agatha Peszt! Strangely enough, it was a picture taken with Mickey Mouse that was the wake-up call for Agatha. Find out how she lost more than 70 pounds with a little help from some pole dancing. In 2002, I entered my first year of college at York University in Toronto, Ontario. Best years of your life, or so they say, yet I was in the worst shape ever. Weighing in at approximately 207 pounds, I was considered obese and found myself shopping at plus-size stores. The frustration of going to a regular clothing store and asking for their biggest size only to find it too small was finally getting to me. 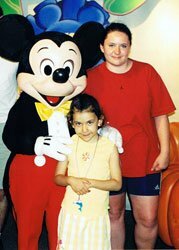 In May of 2003 I went to Orlando, Florida for a family vacation. Prior to this, I avoided taking pictures. If people absolutely insisted, I&apos;d run in for a quick group shot, usually hiding behind someone else hoping to conceal myself from the camera. On this vacation however, I realized that if I keep this up I won&apos;t have any photographic memories from my 20&apos;s. Plus, you don&apos;t meet Mr. Mickey Mouse himself without taking a photo! Upon my return, I developed the pictures and sat down to have a look with the rest of my family. This was my wake-up call. Somehow prior to seeing these pictures I was still in denial of just how overweight I really was. My weight was holding me back in several aspects of my life and I needed to change that. At the time, I knew very little about diet or exercise. I didn&apos;t know how many calories I should be eating, what foods were considered good or bad, I didn&apos;t even know that sugar was carbs, needless to say, I was completely clueless! I started researching a little, seeing what kind of diets were out there and what I had to do. This was around the time that Atkins came out. I read a little bit about it, not in too much detail, and decided that low-carb was the way to go. I cut out bread, pasta, and any type of baked goods for a period of 3 months and got down to 185 pounds. At around this time I hit a bit of a plateau. I was still eating low-carb but the scale would not budge. Being happy with my progress so far, I decided to take a break and just try to maintain for a bit. After about a year, I realized that although weighing 185 pounds is much better then 207, there&apos;s definitely room for improvement. With the 2005 new year fast-approaching, I decided to try another diet. I settled on the South Beach Diet (even bought the book!) and made it my new year&apos;s resolution. Around the same time I got a gym membership and started doing cardio 2-3 days per week. 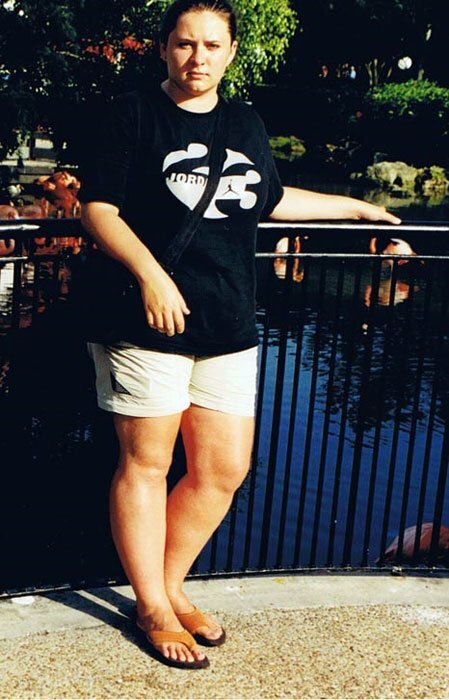 By May of 2005 I was down to 150 pounds and ready to take another break. In January 2005 I Went On The South Beach Diet. This is when people really started to notice. Losing 20 pounds when you&apos;re over 200 was almost undetected by most, but going from a size 14 to a size 8 was a different story. 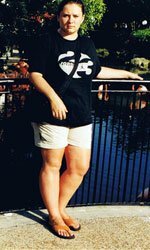 I maintained this weight for about a year, and then summer of 2006 rolled around, which turned out to be my biggest setback. I was finishing my last year of college, working a full-time job, plus a part-time job on weekends. I was unbelievably stressed and my diet and exercise plan went right out the window. I became a slave to the fast food drive-thrus and the XL double creme, double sugar coffees. By the end of the summer I was physically exhausted, crashing and 20 pounds heavier. I was not happy about my relapse, but I was not going to sit there and cry over spilled milk. The realization that I could be back where I started just like that is what made me recognize that doing these fad diets was not the way to go, I had to make a permanent lifestyle change. This is when things really picked up steam and I started doing some proper research. Instead of focusing on fad diets and what the latest diet craze was, I researched how the body really works. I learned about calories, fats, carbs and precious protein! I set a goal weight of 130 pounds and started measuring my food, tracking calories and implemented the 30-40-30 ratio into my diet. My friends knew I was dead serious about reaching my goal weight when I completely cut out all alcohol, and being Polish that says a lot! Ha-ha, here I am backing up that stereotype! I started regularly attending the gym, 5 days per week (doing mainly cardio) and reached my goal weight in August 2007. I couldn&apos;t believe I had done it. It took me 4 years, from June 2003 to August 2007, but I finally did it. But now what? The last 4 years of my life I had been trying to lose that next pound and now there were no more pounds to lose. I was somewhat lost. I maintained for a few months but when February 2008 came around I was bored and still searching for something else to do, and that&apos;s when I discovered weight training. Within a few weeks of regularly training I was hooked. And where did I learn how to train? Bodybuilding.com! I still have the Exercise Guide Database bookmarked on my laptop! Almost a year later, here I am, even more educated about nutrition and training and in the best shape of my life. A typical sandwich minus the butter/sauce. During the initial part of my weight loss I didn&apos;t do much weight training. I would do a total of one hour on the elliptical, stairmaster and/or treadmill, 5 days per week, and that was the extent of that. Since starting weigh training regularly (February 2008), I found that cardio felt like a complete chore and began looking for something a little more exciting then the treadmill. That&apos;s when I tried out pole dancing and after a single class I was hooked. Goofing Around Before Pole Dancing Class. Also, my pole dancing studio incorporates an ab routine into each class. Depending on the instructor we&apos;ll do a variation of crunches, sit-ups, and/or pull-ins. This gives me an extra ab workout for the week, and variety is always a good thing. I also weight train 4 days per week. Before every workout I do a 10-minute warm-up on the elliptical. I usually do 4 sets of 12,12,10 and 8 reps, first being a warm-up set, and the last being my "lift until you can&apos;t lift no more" set, with about 60-90 seconds rest in between. I start off light and increase weights with every set. My rule of thumb is that if I&apos;m not struggling past my 6th rep on my last set then I am not lifting heavy enough. Off day or make-up day in case I missed a workout during the week. The first thing I always tell people who are trying to lose weight is to realize that the only thing standing between you and your weigh goal is yourself. Nobody is forcing you eat to the things you eat and no one is holding you hostage preventing you from being active. Sure there are exceptions, you may have an injury or disability, but for the most part there really isn&apos;t anything one can&apos;t do if they want to do it. If you want results then you&apos;re gonna have to work for it, no ifs ands or buts. You&apos;re Gonna Have To Work For It. Also, I found it a good idea not to set a strict goal date and be realistic with goals. From time to time stop to see how far you&apos;ve already come. Often while trying to lose weight, we&apos;re so preoccupied with losing that next pound that we fail to see how much progress we&apos;ve already made. If one week you don&apos;t make your "lose a pound a week" goal, stop to see how much you already lost. Seeing how a pound a week adds up over time will give you that extra motivation to stick to it the following week. To my fellow females, don&apos;t be intimidated by free weights and/or weightlifting, and don&apos;t be afraid to lift heavy! I&apos;m sure many of you&apos;ve heard this before but you wouldn&apos;t believe how many women approach me about weightlifting and ask if I lift light. Absolutely not! If you want to build muscle you have to push it past its limits, I go as heavy as I can without injuring myself. And last but not least, stay focused! Keep your goals in mind at all time! If you fall of the wagon get back up and keep going. Don&apos;t give up! I myself had setbacks, but it was having my eye on the prize at all times that kept me going, and the prize? A better and healthier version of me! Keep Your Goals In Mind At All Time!